Now one of Germany’s wealthiest cities, Hanover (Hannover in German) literally had to rise phoenix-like from its own ashes following WWII, but has since become a fascinating blend of ancient and modern. Much of this former Hanseatic League city on the bank of the River Leine fell victim to Allied bombers during the 1940s, but several medieval highlights in the Old Town survived. Holzmarkt and Kramerstrasse, with their distinctive half-timbered buildings, and the 15th-century Old Town Hall (Altes Rathaus), are must-sees, as is the Marktkirche (Market Church). Helpfully, for visitors, the city’s pavements are daubed with a Red Thread, a trail stretching for 4.2km (2.5 miles) that joins up over 30 prime sights and attractions. Like many big German cities, Hanover (Hannover in German) combines the past with a modern face, but it remains an attractive place. It boasts elegant parkland, a large zoo and it has a range of museums and galleries. Whilst exploring, you’ll be unable to miss the city’s quirkier side, revealed in its abundant and innovative street art, from multi-coloured abstract shapes to wacky sculptures. Many fountains and even some bus stops are also creative in their artistry. The city’s calendar is packed with festivals, such as Schützenfest Hannover, the world’s largest marksmen’s festival. Hanover also hosts the world’s second-largest Oktoberfest after Munich, with 160 rides, two large beer tents, and around a million revellers every year. 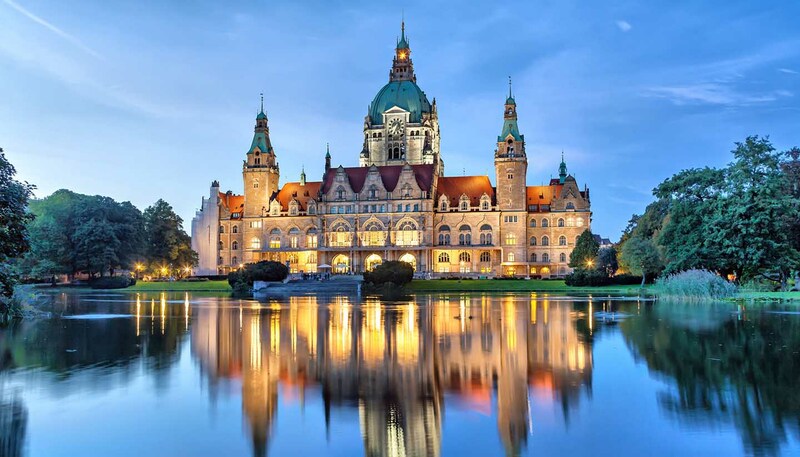 With its good rail connections, and central location in the heart of northern Germany, Hanover makes a handy base from which to explore the region. What’s more, it has all the facilities, shopping and entertainment (including more than 40 theatres) demanded by modern travellers.